Professional Quality Power Made In The USA! Power is the most crucial foundation when building a professional quality 12-volt electrical system. 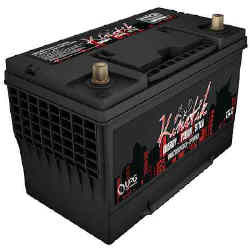 Kinetik Racing's HC-PRO Power Cells are designed for the pro and semi-pro enthusiasts in mind. These power cells are made in a state-of-the-art robotic computer-controlled facility to ensure professional grade power and performance. They feature brass terminals for max conductivity and are built with 99.9% pure lead and rib-reinforced casings. Made in the USA!